The grand finale to a wonderful year of Odd Thursday is happening December 19, 2013! 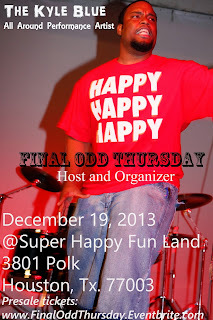 This is the last Odd Thursday of the year! Wonderful great lineup is set for the night. Over 20 acts take the stage. Three hours of straight entertainment and no time for an intermission. Pizza, beer, wine, and super fun will available for your convenience. Presale and discount tickets available here. Offers end December 17, 2013.